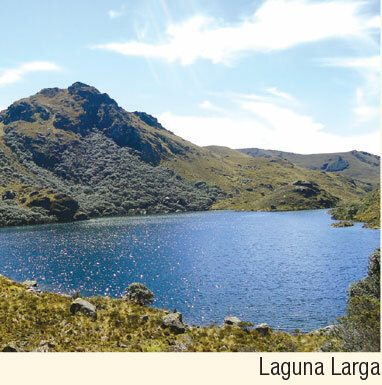 Toreadora lagoon is reached from the Cuenca - Molleturo - Puerto Inca road, about 40 kilometers from Cuenca. Here you'll find an administrative office, an interpretive center and access to the various trails. To get to Llaviucu, take the Cuenca - Molleturo - Puerto Inca road. 7.5 kilometers on from the "Y" at Sayausí on the left is the entry road. From this point, continue along the road for 2.5 km until you get to the entrance of the park. Km 13, 5 via Cuenca -. Molleturo - Puerto. Inca. 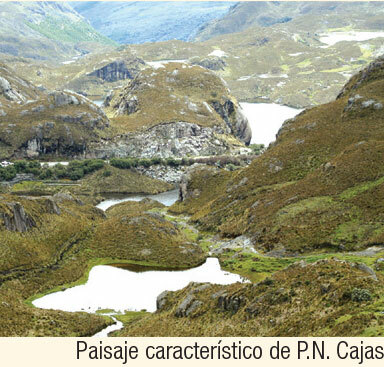 The income of the Cajas National Park. Sector Toreadora. Azuay province. The situation of Macizo de Cajas (the Cajas massif) , located in the part of the Andes closest to the Pacific Ocean, means that their western foothills receive a lot of the humidity of the westerly winds. Another aspect that makes this protected area interesting are the many valleys that exist, produced by the advance and retreat of glaciers thousands of years ago. The water comes down from the high moors to forests and towns down below, creating the Tomebamba, Mazán and Yanuncay rivers. All of these flow into the Paute, which feeds the country's largest hydroelectric complex. The Tomebamba and Yanuncay also are two of the four rivers that cross Cuenca. Other important rivers are the Luspa, the Sunincocha, El Jerez, Atugyacu, El Angas and Yantahuaico. The park has an interpretation center and conference room next to the lagoon The Toreadora and spaces for camping and lodging (for up to six people). Uku. This trail goes around the Llaviucu lagoon and is 1.7 kilometers long; ideal for bird watching. It is an easy path. You can go fishing on its shoreline. Toreadora. Surrounds the lake of the same name and has a length of 2.2 kilometers. The trail is easy. Ilincocha. Just 300 meters, this path crosses a small forest of Quinoas and is ideal for bird watching. Nature and Human History. This tour departs from the Toreadora lagoon, and crosses the Quinoa woodland at the foot of Cerro San Luis, then goes on to Lagunas UNidas, Totoras and the Totoras Garcia Moreno road. It is a moderately difficult route of 4.2 kilometers. The Cerro de San Luis trail is a technical 2.2 kilometers that takes you to the summit of Cerro San Luis (4,264 m), a special natural mirador (lookout). The Camino del Inca and larger lagoons: This moderately technical route is 18 kilometers long ais undertaken over two days." Other routes. Quinuas Valley (8.1 km). Encuentro con las Burines (5.3 km) and the Great Osohuaycu (12.2 km). These routes provide insight into several lakes in the park and other natural attractions. El Cajas, a natural passage between the Sierra and the Costa, was used by the Canaris, who inhabited the area before the Inca and Spanish invasions. The Incas built a road (which you can travel a bit of) connecting Cuenca with the coast. In the republican era, the route was revitalised and renamed the 'Camino Garcia Moreno'. Around the National Park there are several Canari and mestizo villages. A modern road now crosses the park and allows easy access from Cuenca to Guayaquil. The origin of the name El Cajas is disputed; there are several versions of the story. One suggests that it comes from the Kichwa, 'kahas' which means hill or mountain range. Others relate the name to the area's valleys, full of small lagoons and ponds 'boxed' in by the mountains. In any case, the massif and the National Park have traditional and cutural history, manifested, for example, by the numerous mysterious legends inspired by the landscape of the area. Originally the area was declared in 1977 as National Recreation Area, but in 1996 it was changed to a National Park. 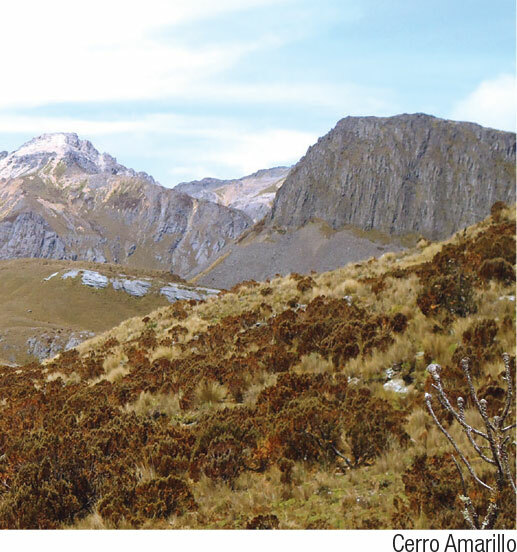 In 2013 UNESCO established the Massif Cajas Biosphere Reserve, which includes Cajas as one of its core areas. The majority of El Cajas a mix of moorland and wooded areas of paper trees (known locally as Quinoas) and lagoons. In the lowlands, around 3,200 meters, Andean forest predominates. Records include 600 species of vascular plants, 43 mammals, 157 birds (including 24 hummingbirds), 17 amphibians and 4 reptiles. On the moor there are extensive grasslands, with cushion plants in the inundated areas. 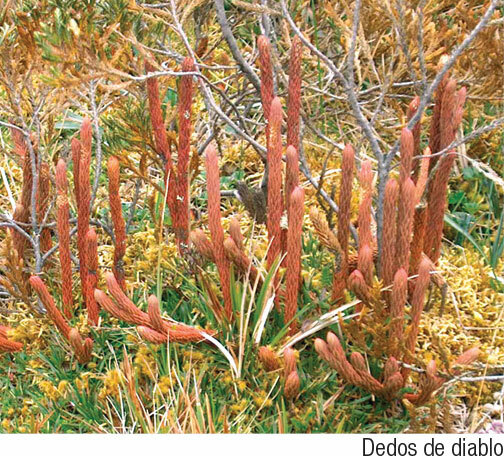 There are also shrubs like senecios, chuquiraguas and Boracherras. In some lagoons there are reeds that can measure up to a meter and a half, and equisetos or 'colas de caballos'. 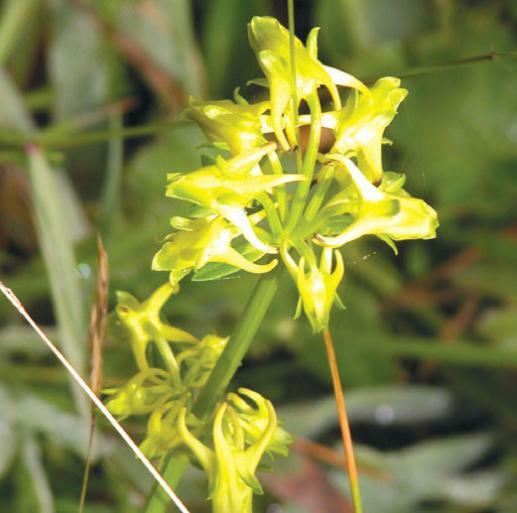 There are several endemic species such as the sarashima, papyrus of Toreadora lagoon, which is a type of reed, and two species of valerian. The paper tree forests are magical environments where the reddish trunks are peeling and mixed with the green of the vegetation. 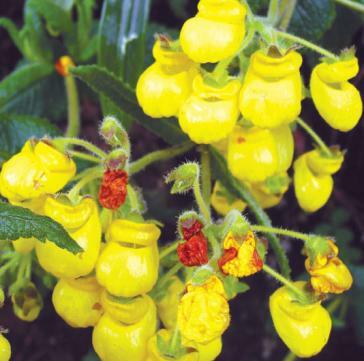 In areas of Jerez and Yacutuviana on the eastern side of the park, and in Mazan and Llaviucu on the west, there are some great examples of Andean woodland. Mazán Forest is very well preserved and extends to the edge of the park. You'll find pacarcar, shuspilla, bermera or 'Tulapa', mortiño and cinnamon trees. Near the Toreadora and Llaviucu lagoons, you can find several endemic Ecuadorean such as mountain mice, the Ecuadorian Quichua cotton rat and porcupine. There is also the endemic El Cajas watermouse, which is not to be found anywhere outside the National Park. Other mammals in the park include rabbits, mountain wolves, deer, chucurillos and pumas. You can see condors, parrots, Andean toucans, Andean guan, tanagers and hummingbirds. In the lagoons there are water birds like the Andean duck, gull Diver and mountain gull. The azulito altoandino bird (literally the 'high andean little blue') and the Quinales live only in the Cajas tree paper forests and its surroundings. Most of the amphibian life is on the moor. There are cutin frogs, marsupial frogs, cohete frogs, the Mazan Aarlequin frog, amongst others. Reptile life includes lizards and guagsas and a species of snake known as the 'serpiente corredora del Yanuncay'. If you take the Basin - Molleturo road, the first lagoons to appear are Llaviucu and Toreadora. There you can enjoy the wilderness and Quinoa forests, which are dreamy landscapes. 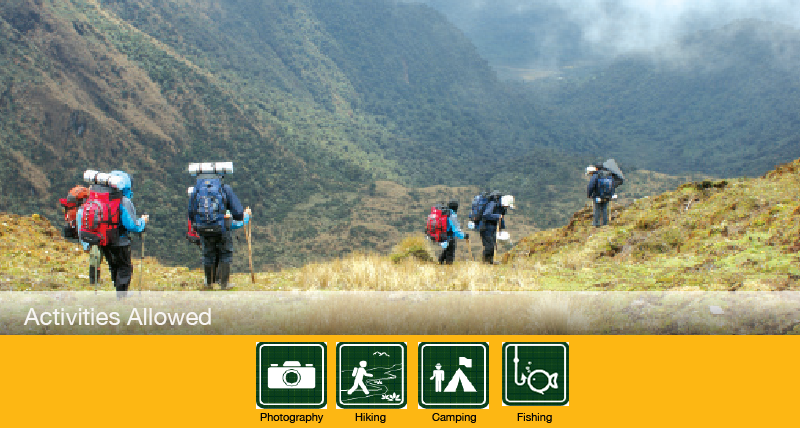 From Toreadora you can walk to the Illincocha lagoon. From The Toreadora is a path into the park to other lagoons. The first to appear are the Burines Valley lagoons, on a plateau ideal for camping. Continuing south, you get to Lagartococha and Cueva de los Muertos, where it is believed that travelers and liquor smugglers died of cold. At southeast of Burin is Taitachungo or Mamamag. This route through the Cajas National Park used to serve to connect the sierra and the Coast. The remaining stretch began in Tomebamba (Cuenca today) and culminated at Molletura Walls, outside of the protected area. The 'Walls' are a set of pre-Hispanic buildings indicating that there existed a people or important resting site Cañari and Inca at the time. Clothing. Warm clothes, waterproof poncho, sweater or raincoat in case of rain or drizzle. Proper footwear, walking boots if undertaking medium or long walks. Guidance. Some sites require the accompaniment of a certified naturalist guide from a licensed park. They can lead groups of up to 15 people. Reservations are recommended consult the regulations before you visit.